They say that art is subjective, but one new artist is challenging the perceptions of art lovers everywhere with his abstract work. The reason this new artist is creating such a stir is simple; he’s a dog. Ziggy is a three-year-old Pekingese and he’s been ‘painting’ for the last two years. Unlike many artists, including Picasso, Ziggy isn’t poor. 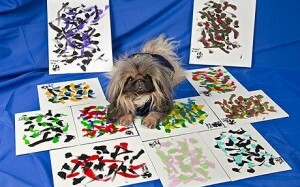 Ziggy’s art is selling for up £171 per painting to art lovers and collectors. Does your dog need a dog bed? Yesterday’s article about the Kennel Club’s change in breeding standards has caused a backlash from the breeding societies. The BBC broadcast a recent documentary about the side-effects of unhealthy breeding, caused primarily by over-keen breeders looking to breed their dogs to conform to the Kennel Club’s breeding standards and ultimately win a rosette at one of the pedigree dog club’s dog shows, such as their highly prestigious Crufts show. One piece on the programme which caused much uproar was the revelation that a Pekinese, the Best in Show dog of 2003, had had surgery (soft palate resection) so that it could breathe.